NICOLE RICHIE NEWS: simonecamille.com coming soon! 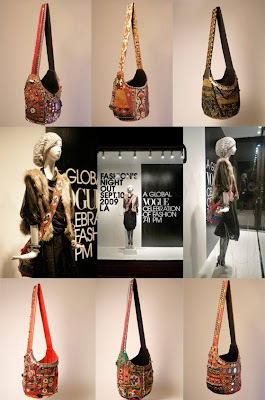 A while ago i wrote about Nicole Richie's patchwork bag which is designed by Nicole's stylist Simone Harouche. Simone's bags were not yet available .. until now! simone camille bag is here… website is coming soon! "I've been getting a lot of emails about the handbag i made for Nicole Richie. I wanted to fill you guys in on it. 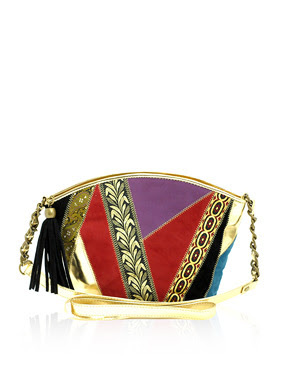 the bag is part of a “one of a kind, limited edition collection” of about 80 handbags. i have been making these pieces in my free time, when i get a little time off from styling. i named the collection “Simone Camille” as thats my middle name…;) anyways, just wanted to let you all know that i am working hard on getting the website up and running (www.simonecamille.com) and i promise you, it will only be a few weeks away till we are live! but until then, my bags are also available exclusively at Ron Herman on melrose in Los Angeles, as well as Ron Herman in Malibu. they are all one of a kind, handmade bags, comprised of vintage textiles that have come from all over the world. These bags are a real labor of love for me, and something i really am passionate about. each one is special and has a personality all of its own. here are just a few examples. oh also, check out the pic of my bag on the mannequin in the window of ron herman on melrose! i got so excited when i saw it, i jumped out of the car and did an impromptu photoshoot…. the pics of me are for another blog entry, but for now, just check out the window! i hope you guys like them!" I think Simone Camille is an amazing collection of patchwork bags and as they are all handmade they are extra special. I am so excited for SimoneCamille.com to open! But for now if you are looking for a quick fix patchwork bag check out these two below. 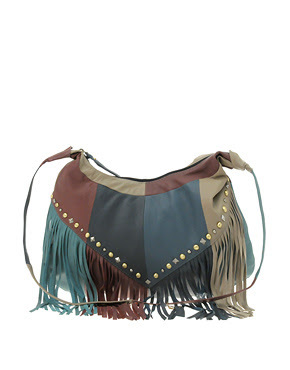 Leather Patchwork Fringe Studded Bag - £30. Patchwork Fabric Mix Across-Body Bag - £20. I'm going to make one myself. i wish i could afford that!!! take a look at Ebay... there a lots of similar ones. You can buy one of these and add some other details like paillettes, old/vintage jewellery or whatever you desire... look for 'patchwork bag' 'india bag'. And of course, you can make one yourself. All that would make it one of a kind.